The Copper Spiral Tube Feeder from Songbird Essentials is an innovative and unique perchless bird feeder with a copper wire spiraled around its exterior to allow birds the ability to run along it, jump between perches and still have enough space to access the center seed supply. The Copper Spiral Feeder measures a full 17" tall and features additional aluminum and stainless steel construction as well as a patented squirrel-proof locking lid. Its design also makes cleaning easy and allows seed to be fed from the top and bottom, so you can effortlessly ensure that its 1.5 lb. seed capacity doesn't grow old or moldy. I love this bird feeder -- first because the finches love it, and secondly because the bottom comes off so I can fill from the bottom and the birds never get stale seeds. AND I got the feeder sooner than they promised. Great service, great product. Other birds feed from this because of the spiral perch. Even downy woodpeckers. The birds seem to love it!! 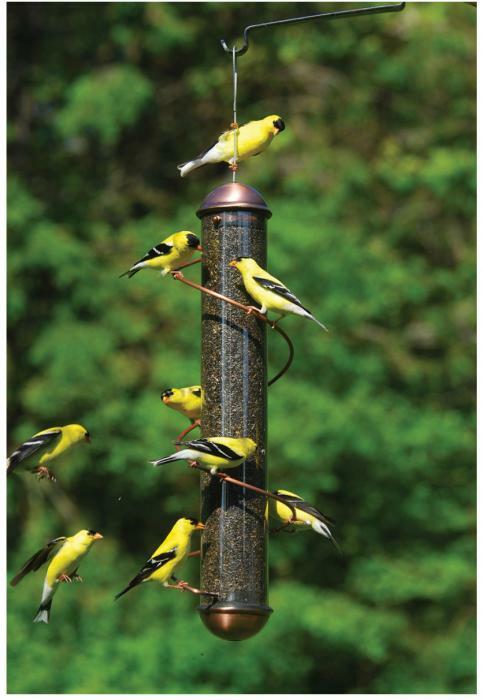 Finches have easy access with this style of feeder and it is easy to refill as well. I absolutely love this feeder and the finches do too! It is a cool design and great fun watching the birds "do the spiral shuffle". It is easy to fill and clean too! The 17" copper spiral thistle feeder is well made and good looking. It is easy to fill and clean, and time will tell how it holds up. You have to keep it filled for all nine feeding ports to be used, but thats the price you pay to be able to have lots of birds on one feeder. I bought this bird feeder as a gift for my mother in Illinois. She loves it! She was having difficulty getting birds to feed with her old feeder and this one is bringing in the birds. This is a nice feeder and the birds love it! 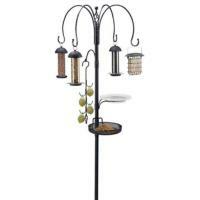 My dad is pleased with this product and he found the birds really do move around on the spirals! This is clean and stylish, keeps seeds dry, but not too many birds are coming. This is very nice quality. This feeder looks nice, and the birds seem to appreciate the spiral perch! I guess I was expecting a higher quality feeder for the money. It is neat to look at; the spiral is neat. The small holes are a plus for keeping the seed in the feeder when the winds blow. Design beautiful but birds cannot locate feeder holes.